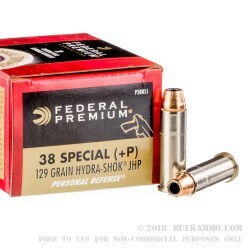 It might seem like an oddball grain weight for .38 Special ammunition, but this is a very well harmonized load by the Federal Premium line which puts a 129 grain projectile into a high potency load with a +P rating that delivers excellent ballistics by the numbers and has a proven performance according to the testing that has been conducted on the Hydra-Shok bullet. The resulting performance from this well-balanced load is as follows by the numbers: 950 feet per second velocity out of the muzzle with an energy delivery of 246 pound feet. The more than 13” of penetration offers significant threat stopping potential. 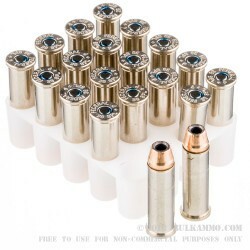 The low cost of this round compared to other ultra-premium offerings shows the value of the Federal Premium line and the perks of being a user of these fine cartridges include the nickel plated brass cases and the high quality clean burning powder as well as the Boxer primer which makes these casings ideal for reloading. 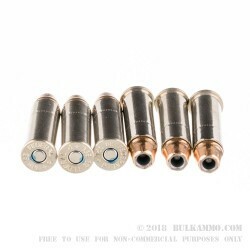 That kind of value add is important to many shooters and the .38 Special +P round that is offered by Federal utilizes top tier brass for multiple reloads potentially. 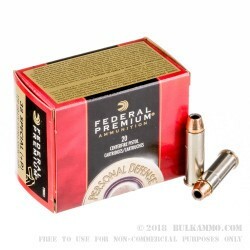 Note: this ammunition exerts much higher pressures and significantly increased recoil comparative to standard .38 Special offerings and as such should not be used in firearms that are not rated to accept +P or +P+ ammunition. Please check your firearm owner’s manual for information regarding suitability of this round in your gun.